If you are looking for inexpensive comfortable chairs, then you should pay attention to the saucer chairs. They are surprisingly lightweight and easy-to-move, moreover, all models are foldable and can be stored without taking up much space when not in use. What is a saucer chair? Because of the convenient rounded shape, such chairs are also known as “moon” chairs. The support is a metal tubular construction, which provides stability. For outdoor usage, metal tubes are sometimes covered with a special powder, which makes them resistant to weather. On top is a seat-cushion, which is attached to the metal frame to prevent slipping. In most of the chairs, the seat is filled with a special foam to ensure complete comfort and relaxation. As a cover for moon chairs to be used indoors, decorative fabrics such as faux fur, microsuede, corduroy are used. And the chairs for outdoor use are equipped with a seat, which is made of strong polyester fabric to maximize ease of care. 1. The size. It’s the most important. Moon chairs are available in three sizes: small, medium and large and are designed accordingly for kids, teens and adults. However, the manufacturer does not always directly indicate this in the title, and adults sometimes order children’s chairs. 2. Cushion material. Plush and faux fur are softer and more elegant, but polyester is more convenient in use because it is easier to clean. The choice depends on how many people will use the chair and how often you plan to clean it. Such material as cotton is desirable to use for family format only: certainly, it is a natural material, however, it is easily stained and perfectly absorbs any fluids. 3. Сarry bag. If you plan to take a chair on a trip, a special bag will greatly simplify life, especially if it has an adjustable shoulder strap. 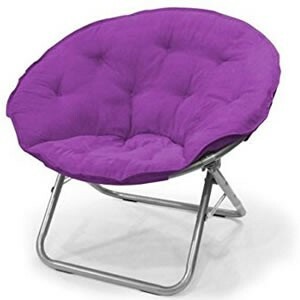 Here we have selected high-quality cheap saucer chairs for adults: 5 indoor and 4 outdoor. All of them do not require assembly and are strong enough. All you have to do is choose the type and size of the chair, and find the color that you like the most. Our list opens with the most affordable faux fur saucer chair, which got very high ratings but has one issue – compact size. 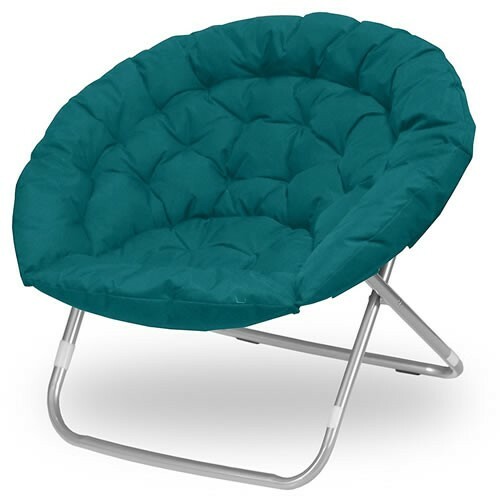 Although the chair is quite durable and is designed for a weight of 225 lbs, it is more suitable for teenagers or students: its width is approximately 28″, and this chair is not high (the front edge of the seat is right at 14″ off the floor). The seat is about 16″ deep and the back rest is 19″ high. 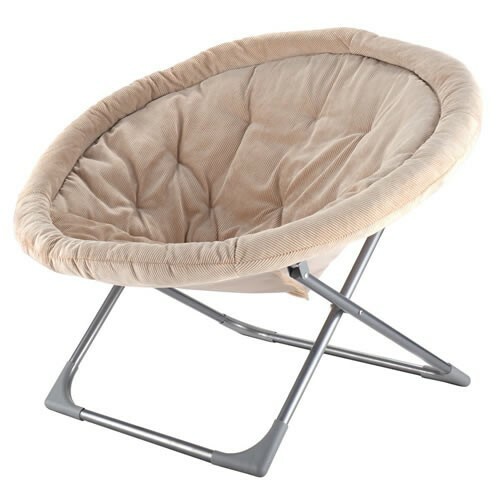 This saucer chair is very sturdy, well-built and super soft. It is ideal for watching TV or reading – for a dorm room, game room or family room. The cushion is covered with faux fur, that looks very decorative and even luxurious. However, it is quite difficult to clean faux fur, therefore mainly spot cleaning is supposed. And still the cover is washable, but you should use gentle cycle and air dry only. A huge plus of this model is the variety of color options. You can choose the color of the chair for any interior. By the way, you can choose several chairs of different colors and make a stylish combination. This chair is available in 10 colors: Black, Grey, Blue, Blush, Mint, Navy, Purple, Red, White and Silver. This saucer chair almost completely repeats all the characteristics of the previous one except for the cover material – here it is microsuede. What is its difference from faux fur? This fabric is not so soft, but much sturdier. The main advantage: it is much easier to clean it and it looks just like a new for a very long time. The second difference: this chair is available only in fancy 4 colors: Black, Iris, Pins and Royal Spice. However, these are not “simple” colors, and this color palette is enough to decorate any interior. Once again, note: this chair is more suitable for teenagers under 16 years, although it is designed for 225 lbs. Yet, if your weight is more than 120-160 lbs, this moon chair may be too small for you. This is the first chair in our list, which is of sufficient size to easily accommodate an adult. And the only chair whose height can be adjusted. You can choose one of three positions, changing the height of the chair from 14.2 “- 15.4 (at the front) to 26.8” – 33.3 “(at the back). Dimensions of the cushion are 35.4 “× 34.6” and this is enough to provide full comfort. Another unique feature of this chair is a removable cover. Agree, spot cleaning is good, but sooner or later there comes a time when all the cover needs to be refreshed. And in this sense, this chair is the undisputed winner. The cover is easily removed and can be washed in a washing machine – however, only a delicate washing mode and air drying are recommended. By the way, if you have minimal sewing skills, you can sew a lot of covers for this chair, choosing the fabrics and colors you love. As for the colors, only the beige color and the cheerful orange-white pattern are available. Cover material is corduroy – soft enough, although not the most durable. It is very possible that after a while you will have to think about fixing. And this time can be extremely short. Unfortunately, this chair cannot be called particularly long-lasting. Moreover, customers complain that sometimes the chair comes misaligned and it is impossible to fix it. And yet – it is hard to take this chair down after putting it up, especially for teens or children. And, by the way, do not be misled by the name “oversized large saucer moon chair” – in fact, it’s just a chair of sufficient size, so do not expect much from it, especially considering the price. This chair completely repeats the very first in our list except for the dimensions: it is slightly smaller in diameter, but higher by 7 inches. Thus, it is ideal for public places as alternative seating choice. It is light enough to easily be folded up and/or moved around to make more room. This chair is perfect for classrooms, small libraries or places where you need to wait. The frame is strong and is made of a higher grade aluminum. The cushion is made of good fabric material that has a “plush” feel to it, but at the same time is strong enough. The chair is available in 15 colors, BUT beware, that other colors are MUCH more expensive. And, finally, a really great comfortable chair, which is sure to please you. Surely, it has the appropriate price – but real comfort costs this money. 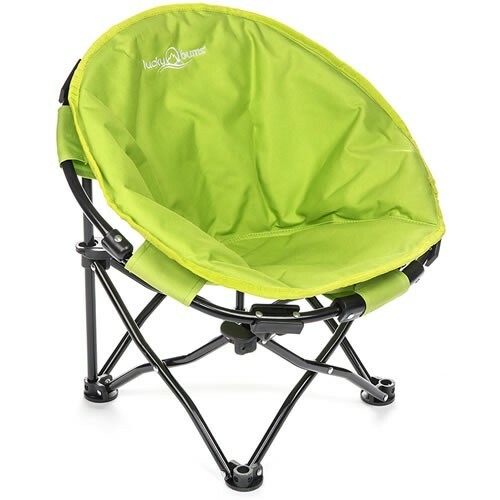 This chair is really comfortable for social visits, outdoor events, or just to relax on the porch, gazing at the stars with a pillow and a blanket. The material of cushion cover is polyester – which is fairly stain resistant and always looks great. These covers are really strong and well-attached to the frame. The chair is easy to clean by wiping down and spot cleaning. But by removing the bolts in the chair’s base you could take it apart and remove the seat cushion for laundering. Durable and weather resistant, this product is suitable both for indoor and outdoor use. 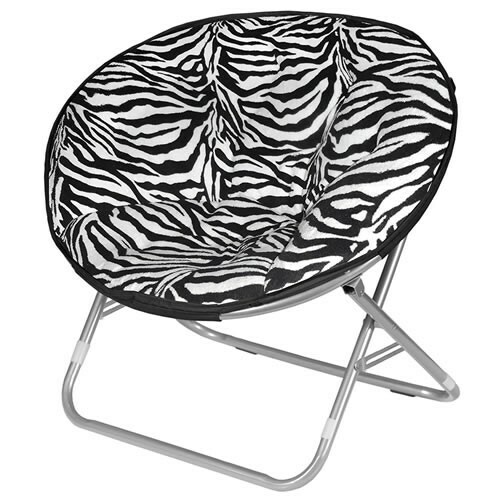 This chair is available in 7 color options: Aubergine, Black, Dark Brown, Khaki, Navy, Stripe Multi Color or Teal. Please, note that each color has its own price, which is different from the others and sometimes quite noticeable. 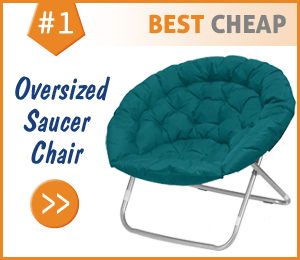 And now let’s look at the cheap saucer chairs, which are designed for outdoor usage. First of all, they differ in materials: the metal frame is covered with weather-resistant powder. Instead of a soft pillow, there is a specially designed seat made of a dense waterproof and stain-resistant fabric. The filling of the seat is not so soft, but despite this, the chairs are quite comfy and you can sit in them for hours (for example, fishing) without feeling any inconvenience. Due to the fact that there is no fluffy pillow, these chairs weigh much less, besides, they are often sold together with a carrying bag which is very convenient. And, of course, the folding mechanism has a completely different operating principle. Instead of two simple hollow metal tubes, there is a more complex design with many connections. Due to this, outdoor saucer chairs can be folded as compactly as possible for a more convenient carrying. 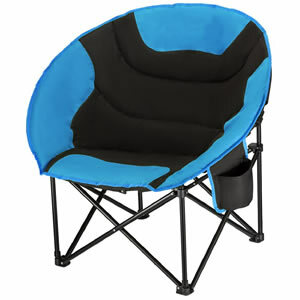 Such chairs will be indispensable for fishing, camping, picnic, beach, park and for any other outdoor activities. These kids folding chairs come in 2 cute colors: blue and green. 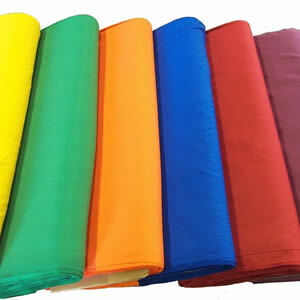 They made of very durable 600D Oxford fabric and are designed for the weight capacity of 70 lbs. Chairs are easy to fold in seconds, and weigh only 4.3 lbs – even a child will easily cope with them. A bag with shoulder straps for hands-free carrying is attached. To prevent accidental folding and the fall of the child, the chairs are equipped with safe locks for extra stability. And anti-slip foot pad provides even more protection. Chairs are solidly made and very sturdy. All seams, stitching and stress points are double reinforced. The design is very user-friendly and it can be easily opened and folded. Please, note, that these chairs are really pretty small. Honestly, they will better fit a 2-year child, than a 10-year teen. And when your baby grows up, you can always give this chair to your pet – this folding chair is perfect for medium-sized dogs. This chair is presented in three sizes: small, medium and large. Of course, each size has its price. Moreover, you can choose one of 5 bright colors: Blue, Green, Pink, Kryptek Highlander or Kryptek Typhon. Comes with a black carry bag, which has a colored line (the same color with chair). Except for the dimensions, the chairs have the same technical characteristics. The chair features a coated steel frame and a padded polyester seat (double layer 600D Oxford). It holds up to 200 lbs. Compared to other folding chairs, this one is slightly more cushioned, which makes it one of the most comfortable. This chair is durable, but only if you do not overload it. Do not place heavy objects on the chair when it is assembled. These chairs have responsive customer’s support, which helps to fix most problems. If you received a broken item, they promise to replace it immediately. Note: Be sure to check the dimensions BEFORE you order this chair. 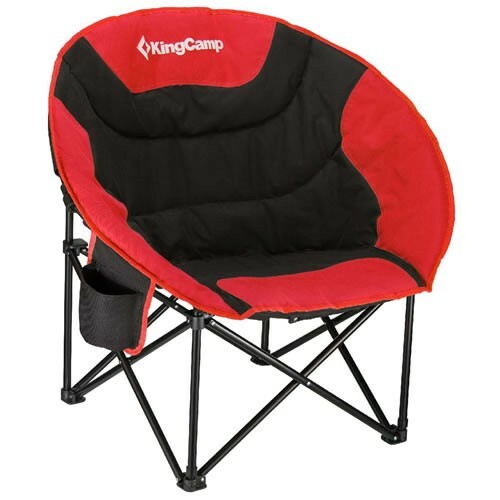 First of all, it should be noted that this camping sauce chair always receives the best reviews from customers. This chair is well-made, sturdy and very long-lasting: you could use it every day, and it will always look like new. The seat is made of heavy-duty polyester fabric, breathable and moisture-wicking. And it’s quite soft and comfortable. To clear, it is enough to wipe it. But, in case of severe contamination, you can pour it from a hose and clean it. This chair has a cup holder, but there is a little confusion: red and chartreuse items have cup holders, while blue and black chairs do not. A cup holder itself also has an issue: it is suitable for bottles or for cups that are in some way closed from above and protected from spillage. It’s more of a pocket than a stand: if you try to put an ordinary cup there, then you take a lot of risks. The back pocket is present on all models and it is large and very convenient. While the seat in some way is waterproof, the metal parts are susceptible to rust. Do not leave the chair outdoors for the night and wipe off the moisture if possible. The manufacturer also warns that screws may loosen. So, you need to check and tighten them from time to time. And the last chair is really oversized and comfortable for all ages and weights. Maximum permissible weight is 300 lbs. 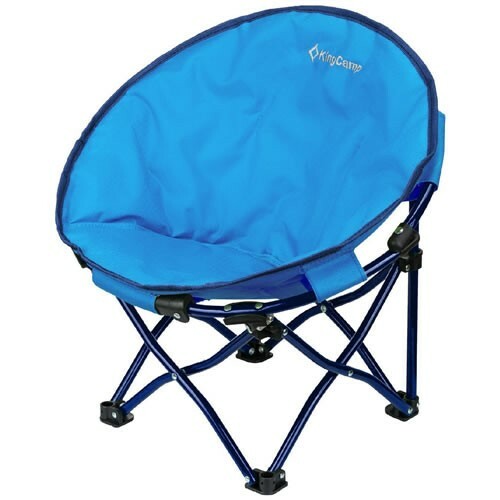 The spacious seat measures 37″ from side to side and is made of very strong padded fill polyester fabric. Pleasant addition: padded headrest for extra comfort and support. 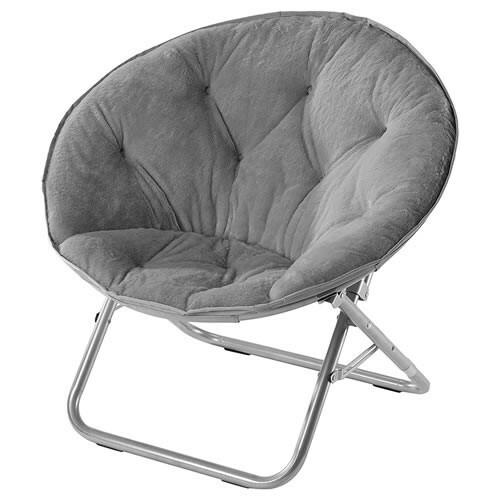 This chair features a durable steel frame that undergoes rigorous drop testing. The feet are made of a durable plastic material, that is very appropriate since the metal parts are prone to rust. 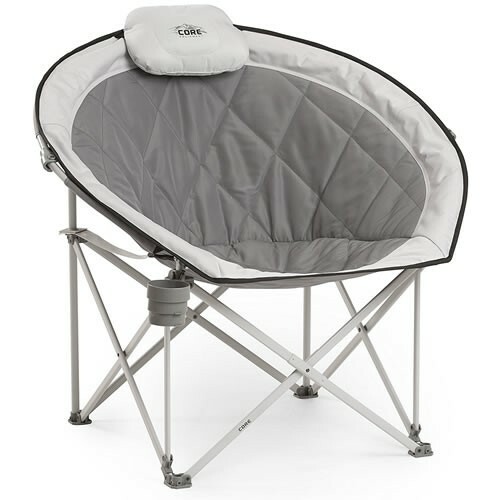 This moon chair also comes with a bag with the carry strap for easy transport and storage. A built-in cup holder is stable, and you can finally put a cup of coffee in there, without fearing that it will turn over. The only available color is gray, or rather, a combination of dark and light gray. The bag is made in the same colors. Be careful: light colors are stain very easily and only spot cleaning is possible. When you are searching for the best saucer chairs for your home, you will find that there are a variety of materials that you can choose from. Knowing which one of these materials best suits your needs will help you pick the right model. 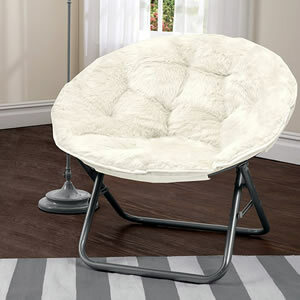 Cheap saucer chairs often come with Faux Fur, Corduroy or Polyester coverings. What is Faux Fur Made From? Faux fur is a synthetic material made from cellulose materials so that they are soft to the touch. This is the most common type of faux fur materials used in furniture. This material can come in a variety of lengths, colors or textures. Faux fur can be made to look like real animal fur, but this practice is more common for clothing or shoes. If you have purchased a saucer chair that has a slip off cover, you can simply take the chair cover off and throw it into the washing machine on the gentle cycle. These covers generally have machine wash instructions on the tag. Many of the chairs that have longer hair may require that you air dry the cover instead of using the dryer. If the cover is non-removable, you will have to wash spots on the chair by hand. Spray some water on the area and try to blot off any dirt first. If this does not work, you may have to use a gentle soap in addition to the water to get the spot or dirt off of the chair. It is not recommended to soak the chair because the water will settle into the foam cushioning and be much harder to dry. Allow the cover to dry completely before using the chair. This should help prevent clumping or matting of the faux fur. Faux fur that has become matted is unsightly and can become uncomfortable because of the clumping. The good news is that you can easily solve this problem. To make your faux fur look new, take a fine-toothed dog brush to the fur. The right dog brush to use would be square in shape and have very close bristles in varying lengths. Start by brushing the area around the matting. This will give the brush more agility when you begin to work on the mats. Once you are ready, you will want to start near the end of the mat and work your way towards the base material. Gently brush the fur until all the matting is removed. Once completed, you will find that your chair cover will look new again. Brushing will also help move any small debris caught in the chair out of the materials and keep the chair looking its best. What is Corduroy Made From? Corduroy is a material that is generally made from all cotton threads or a cotton/polyester blend. The term corduroy is a reference to how the material is made and not the materials that the material is made from. Corduroy is made in a striped fashion. The material is woven with two lines high and one line low or bare to the material. It is what gives the material the striped appearance and textured feel. 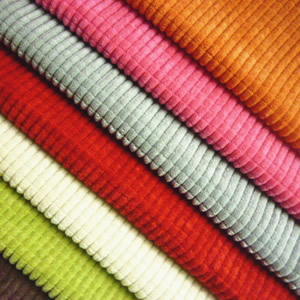 Corduroy is made very similar to velvet and was considered to be a superior weaving method reserved only for royalty. In modern times, corduroy became a preferred material for making pants because of its durability. The popularity of the material quickly transitioned to other areas of fashion as well as the furniture industry. If your cover is removable from your chair, gently remove and place it in the washing machine by itself. You will want to wash it on the gentle cycle using a mild soap. It is important to wash your corduroy alone because the way the material is woven it will attract lint from other pieces of material. Make sure that you check the label on the cover. The manufacturer may have specific instructions, such as water temperature to use, that will help you clean your cover without any resulting damage. If your cover is not removable, you can still clean your chair. Mix a gentle detergent with water into a spray bottle and get a soft cloth to clean with. Work on one spot at a time and spray, do not saturate, an area of the chair and rub it clean with the cloth. Move the cloth in the same direction as the cords in the corduroy, this will keep the fabric looking good. Once the cleaning is completed and the fabric is dried, take a lint brush to your chair. This will remove any debris and lint that has attached to the chair and allow you to brush out the cords so that they look nice. Taking a lint brush to your chair occasionally will allow you to keep the chair looking its best for a longer period of time. Polyester is a fabric made from a polymer. It is 100 percent synthetic and can be created into any type or style of material. When polyester was first introduced to the public many clothes were made completely from this material. The appeal was that polyester has stain resisting qualities as well as remains wrinkle free. Currently, many manufacturers just use a polyester blend to manufacture materials. A piece of clothing or fabric cover for a piece of furniture is usually a 70/30 blend of polyester and cotton. This blend helps add to the comfort of the material against the skin as well as durability. 100 percent polyester materials are still available. If your cover is removable, you will want to take it off of the cushion and wash it in your washer following cleaning guidelines on the tag. If there are no guidelines, wash in warm water with a gentle detergent. Dry on a low temperature because polyester may shrink under high heats. Make sure that you flip the cushion cover inside out to prevent snags from occurring to the fabric. If your chair cover is not removable, you have several options for cleaning. You can try using a furniture cleaning spray that is available at most stores. You spray this cleaner on the chair, let it stand for allotted time, and then you vacuum cushion. This is a very easy way to clean the chair cushion, especially if there are no heavy stains. If you have to clean the cover by hand, then you will want to make a mixture of water and a gentle sop into a spray bottle and go over the chair cushion a little bit at a time and spray and wipe down. Make sure that you do not oversaturate the cushion or it may take a long time to dry. Stains may be treated with water and a dish soap that has strong de-greasing properties. Clean as you would any area that needs treatment. Stain removing sticks for washing clothes are also very handy for cleaning these types of chair covers.